Thomas Acton is Professor of Romani Studies, School of Social Sciences, University of Greenwich. Maureen Bell is an attorney at law. She practices in Orlando, Florida. Susan Caffrey is Senior Lecturer, School of Social Science, University of Greenwich. Calum Carmichael is Professor of Comparative Literature and Adjunct Professor of Law, Cornell University. Sir Angus Fraser is the author of The Gypsies (second edition, 1995). He formerly worked in the U.K government service. Martti Grönfors is Professor of Sociology, University of Kuopio, Finland. Ian Hancock is Professor of Linguistics and English, University of Texas at Austin. He is Director of the Romani Archives and Documentation Center. Angela P. Harris is Professor of Law, Boalt Hall, University of California, Berkeley. Ronald Lee is an author and journalist. He is Executive Director of the Roma Community and Advocacy Centre in Toronto. Gary Mundy was a Research Associate at the University of Greenwich at the time of writing his contribution to this book. He currently works on research issues for the Department of Education and Employment in the U.K.
Anne Sutherland is Professor of Anthropology, Georgia State University. Walter O. Weyrauch is Distinguished Professor of Law and Stephen C. O'Connell Chair, Levin College of Law, University of Florida. He is also Honorary Professor at Johann Wolfgang Goethe University, Frankfurt. Approximately one thousand years ago Gypsies, or Roma, left their native India. Today Gypsies can be found in countries throughout the world, their distinct culture still intact in spite of the intense persecution they have endured. This authoritative collection brings together leading Gypsy and non-Gypsy scholars to examine the Romani legal system, an autonomous body of law based on an oral tradition and existing alongside dominant national legal networks. For centuries the Roma have survived by using defensive strategies, especially the absolute exclusion of gadje (non-Gypsies) from their private lives, their values, and information about Romani language and social institutions. Sexuality, gender, and the body are fundamental to Gypsy law, with rules that govern being pure (vujo) or impure (marime). Women play an important role in maintaining legal customs, having the power to sanction and to contaminate, but they are not directly involved in legal proceedings. 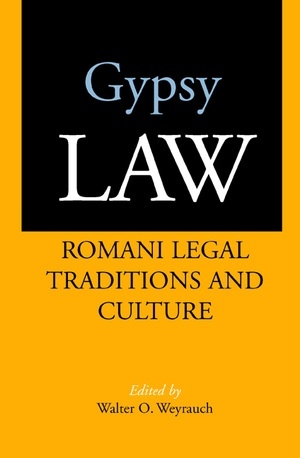 These essays offer a comparative perspective on Romani legal procedures and identity, including topics such as the United States' criminalization of many aspects of Gypsy law, parallels between Jewish and Gypsy law, and legal distinctions between Romani communities. The contributors raise broad theoretical questions that transcend the specific Gypsy context and offer important insights into understanding oral legal traditions. Together they suggest a theoretical framework for explaining the coexistence of formal and informal law within a single legal system. They also highlight the ethical dilemmas encountered in comparative law research and definitions of "human rights." Walter O. Weyrauch is Distinguished Professor and Stephen C. O'Connell Chair of the Levin College of Law at the University of Florida, Gainesville.